I call your attention to the halo around the pole and which methods diminish this halo. Those methods incorporated prior knowledge that this is a Lanczos 3 reduction. Note the presence of halos in the input image. Note the relative absence of halos in the Pseudo LAD result. This was accomplished by modeling the input image as a bicubic(-2) ("-2" is the slope of the continuous kernel at spatial coordinate 1) reduction in the parameter settings. If the enlargement is reduced back to original size using bicubic(-2), it will match the input image almost exactly. Even though the enlargement result shows almost no halo, reduction by bicubic(-2) will produce a halo that matches the halo in the input image. (Attention! The following applies to another image and NOT the clown or the lighthouse image.) Roughly, the procedure is to take a test image, make a reduction of that image, enlarge the reduction back to original size, and then make statistical measurements on the differences or errors between the result and the original. These errors are treated as noise and the most common measurement used for this purpose is peak signal to noise ratio (PSNR), which is simply 20log(255/RMSE) where RMSE is the root mean square error. It is useful to examine another statistic, average absolute error (AAE) in place of RMSE because it is less sensitive to a few large errors. Version 2.0 of SAR Image Processor is fully capable of making these measurements. 2. 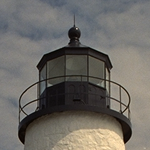 The top row of pixels was cropped off so that both width and height were divisible by four. 4. The reduction was enlarged 4X by a variety of methods. 5. All measurements were on the Y channel of YCbCr color space. 6. Parameter settings were default unless otherwise noted. 7. A border region of 5 pixel thickness around the image was ignored in these calculations. 1 - Smaller is better. 2 - Larger is better. * - Centered using Lanczos 3 interpolation.